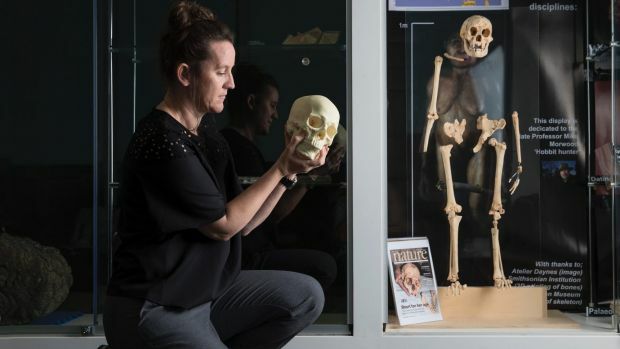 via Sydney Morning Herald, 20 August 2017: An interview with Dr Kira Westaway from the University of Wollonggong and the events leading to the paper about finding 65,000 year old human remains in Sumatra. The discovery by Australian scientist Kira Westaway took treks through Indonesian rainforest, a dogged refusal to take no for an answer, and a fax machine. A new study on the tooth morphology of Homo floresiensis suggests that they may be not be a group deformed modern humans, and may also support the theory that the hobbits were derived from Homo erectus undergoing island dwarfism. Homo floresiensis is an extinct, diminutive hominin species discovered in the Late Pleistocene deposits of Liang Bua cave, Flores, eastern Indonesia. The nature and evolutionary origins of H. floresiensis’ unique physical characters have been intensively debated. Based on extensive comparisons using linear metric analyses, crown contour analyses, and other trait-by-trait morphological comparisons, we report here that the dental remains from multiple individuals indicate that H. floresiensis had primitive canine-premolar and advanced molar morphologies, a combination of dental traits unknown in any other hominin species. The primitive aspects are comparable to H. erectus from the Early Pleistocene, whereas some of the molar morphologies are more progressive even compared to those of modern humans. This evidence contradicts the earlier claim of an entirely modern human-like dental morphology of H. floresiensis, while at the same time does not support the hypothesis that H. floresiensis originated from a much older H. habilis or Australopithecus-like small-brained hominin species currently unknown in the Asian fossil record. These results are however consistent with the alternative hypothesis that H. floresiensis derived from an earlier Asian Homo erectus population and experienced substantial body and brain size dwarfism in an isolated insular setting. The dentition of H. floresiensis is not a simple, scaled-down version of earlier hominins. The full paper can be downloaded on PLOS One. A study published in Science dating teeth found in Sri Lanka suggests that humans had adapted to rainforests for longer than originally thought – the teeth date to around 20,000 years ago. This discovery might have possible implications to how we think about prehistoric human habitation of rainforests in Southeast Asia. Human occupation of tropical rainforest habitats is thought to be a mainly Holocene phenomenon. Although archaeological and paleoenvironmental data have hinted at pre-Holocene rainforest foraging, earlier human reliance on rainforest resources has not been shown directly. We applied stable carbon and oxygen isotope analysis to human and faunal tooth enamel from four late Pleistocene–to–Holocene archaeological sites in Sri Lanka. The results show that human foragers relied primarily on rainforest resources from at least ~20,000 years ago, with a distinct preference for semi-open rainforest and rain forest edges. Homo sapiens’ relationship with the tropical rainforests of South Asia is therefore long-standing, a conclusion that indicates the time-depth of anthropogenic reliance and influence on these habitats.